Join us in our 6th Annual Fundraiser! Eat. Share. Love. 2014 is a buffet dinner event with silent auction, raffle, door prizes and entertainment. It will be held on November 21 at 6 PM at La Proa 1 and 2 Halls, L’Fisher Hotel, Bacolod City. Dinner ticket is at Php 500 and Php 250 (children ages 6 – 12 years and nannies). Kids 5 years old and under are free. Raffle ticket is at Php 200; iPad mini Retina model; only 150 tickets to be sold. 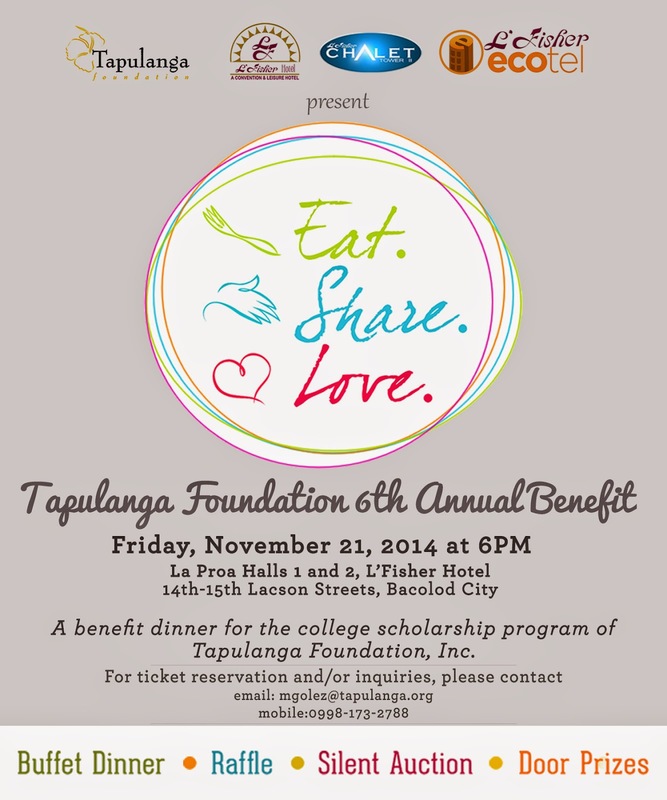 Please RSVP by November 19 (mgolez@tapulanga.org or 0998-1732788). If you would like to donate an item for the silent auction, please contact us on or before November 15. SVG Schuurmans and Van Ginneken Philippines, Inc.
Tapulanga Foundation, Inc. has been providing educational and healthcare assistance to impoverished families in the rural areas of the Negros Occidental, Philippines. We currently send 350 children to St. Francis of Assisi School of Silay City, a private, highly accredited school, for free. We also provide them with books, school supplies, daily lunches in school, immunizations, medical check-ups and much more. Deserving high school students are also given a chance to go to college on full or partial scholarships. Our healthcare program provides free medications, diagnostic procedures and annual medical free clinics to the Hacienda Tinihaban community and scholars of the foundation. Our event entitled “Eat. Share. Love. 2014” aims to promote awareness about Tapulanga Foundation and to generate sponsorships and funds for our college scholarship program, so that we may give those with less a chance for a better life.